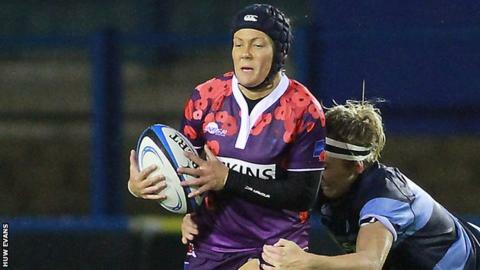 Gemma Rowland has been added to the Wales squad for the 2015 Women's Six Nations. The Wasps centre, 25, impressed in Sunday's 31-12 defeat to Ireland in a training match at Ashbourne. She is one of six uncapped players in the squad alongside Rebecca Rowe, Melissa Clay, Amy Evans, Keira Bevan and Hannah Jones. Wales begin their campaign on Sunday, 8 February at home to England Women at St Helen's, Swansea. Rowe, Clay and Evans came through a talent identification programme in 2014. They join experienced players Jenny Davies, Catrin Edwards and Rachel Taylor - who together have 174 caps. "It's great that players of that calibre are still involved", said national coach Rhys Edwards. "They bring with them a vast amount of knowledge and experience and they are determined to pass on the baton and leave a legacy of securing World Cup qualification for the next generation," he added. Forwards: Caryl Thomas (Bath Ladies/Scarlets), Jenny Davies (Blues), Carys Phillips (Skewen/Ospreys), Delyth Davies (Scarlets), Amy Lawrence (Skewen/Ospreys), Catrin Edwards (Llandaff North/Scarlets), Amy Evans (Skewen/Ospreys), Jenny Hawkins (Llandaff North/Blues), Rebecca Rowe (London Welsh/Dragons), Sioned Harries (Whitland/Scarlets), Melissa Clay (Pencoed/Ospreys), Rachel Taylor (capt; Bristol/Dragons), Sian Williams (Worcester/Dragons), Shona Powell-Hughes (Skewen/Ospreys). Backs: Amy Day (Llandaff North/Dragons), Keira Bevan (Skewen/Ospreys), Elinor Snowsill (Dragons), Hannah Jones (Penybanc/Scarlets), Rafiuke Taylor (Pontyclun/Blues), Ffion Bowen (Maesteg Celtic/Ospreys), Gemma Rowland (Wasps), Robyn Wilkins (Llandaff North/Blues), Kerin Lake (Skewen/ Ospreys), Adi Taviner (Skewen/Ospreys), Elen Evans (Scarlets), Laurie Harries (Llandaff North/Blues), Dyddgu Hywel (Pontyclun/Scarlets).